Google the street address. Make sure it's not a mail box rental address creating the appearance of a school location. Our location. Verify that the school is approved in your state. Many states require home inspector courses from an approved training school. Our approvals. Call and ask to speak with the course instructor, not a sales rep whose goal is to convince you to buy today. Talk to our experienced instructors anytime. Find out if the school specializes in home inspection rather than an assortment of general career training. We know the business. Check the school's credentials to assure it is state-licensed, bonded or registered to lawfully provide real estate training. Our credentials. Confirm that your training course doesn't expire. Some schools cut-off your online access after 6 months and/or charge a monthly fee. We offer lifetime access. Examine the return policy carefully. Some schools offer very short return periods with any number of conditions. Our unconditional 30-day return policy. PHII sets the standard for quality home inspector training at an affordable price. We were the first school to offer interactive online training for home inspectors, along with the first to offer a hybrid live training component. We believe in service first and still offer all students a free training lab at our facility. Plus we consistently update our online course materials as the industry changes. In the past two years we have added over 100 pages of updated content and over 800 new exam questions. PHII's online training provides a proven interactive learning solution with lesson pre-tests and post-tests, flash cards, video, feedback and the human support element that is so critical to success. With many years of experience and tens of thousands of home inspectors trained, PHII remains the leader in the online home inspector training field. We teach you what you need to know and help you every step of the way. PHII trained inspectors are never alone. *States have many different licensing requirements for ancillary inspection services. PHII's home inspection course offers general training about ancillary inspection services so that you can decide whether to pursue additional certifications that meet your state's requirements. Some competitors claim to offer free training on mold, radon, energy audits, building codes, commercial inspection, etc., that will allow anyone to immediately perform these ancillary services after taking their home inspection course. Ask if these are approved, instructor-led courses with expert support that meet your state licensing requirements (e.g. radon licensure is highly regulated) or just general videos and reference material added for appeal? In every case we have found the later to be true. When it seems too easy to be true it usually is. There are no short-cuts to becoming qualified. PHII's courses are approved by real estate and building commissions, and major insurance providers. We are also affiliated will major professional associations including ASHI, NAAHI, CREIA, and FABI. The course material is aligned with national standards of practice and is updated regularly. We teach you the key information that you must inspect for and include in your final report. Every lesson is concise and written in clear language that is easy to understand. Every PHII interactive course is designed in-house by experienced and qualified instructors who understand the trade and how to teach it. We also include lessons on mold and allergens, radon, and commercial inspections so that you can decide whether to pursue other certifications. 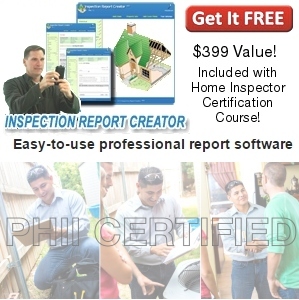 PHII offers the most complete, self-paced home inspection course on the market today. You receive instant online access and a package of course materials shipped to you. Our course management system is unmatched in features and interactive technology. You can take the course on almost any electronic device including popular tablets, and the course can be completed in as little as 1-2 weeks. Unlike most other online courses, there is no time limit, so you can take as much time as you need and finish at whatever pace you set, quickly or over time. Your access to our course system never expires! All PHII graduates are lifetime-certified and can return to refresh their training at no cost even if they have left the profession. Compare that to some schools that cut-off your online access after 6 months unless you pay additional fees. With some home inspector associations you remain a certified home inspector only as long as you continue to pay membership dues. Your PHII lifetime home inspector certification is a permanent credential you can proudly display for your entire career with no recurring certification charge. You can also add your PHII Trained and Certified logo on your website or marketing materials. With PHII there is one fee and no surprises! PHII graduates also receive a free year of membership in the North American Association of Home Inspectors (NAAHI), a national non-profit home inspector association for the United States and Canada. NAAHI Membership is an excellent credential to place on your marketing materials. Investigate any offers about free association memberships carefully, as some are for-profit associations, or charge very high renewal fees. PHII also provides you with a free 1-year business website subscription to InspectHost.com, an e-commerce solution for home inspectors that includes an inspection ordering system, payment tracking, credit card processing and e-delivery of reports. This is a great turnkey system for promoting your business online and serving as a resource for existing customers. Simply put, PHII is different. No one at PHII is paid a commission and everyone is here to help you succeed! Our purpose is to provide a great training experience for our students. You deal directly with experienced staff and instructors at our school location in Madison, SD, who are here everyday to help our students from start to finish. The same staff that provides information about our products will be there to help you with ongoing support as you start inspecting, run into something strange and have questions or need a second opinion. No wasted time, just direct help from our great staff! You won't get that type of personal mentorship anywhere else from licensed home inspectors and instructors who are well-qualified to provide the support. We are the only home inspection school you will find that guarantees your satisfaction unconditionally, offering a 30-Day money-back guarantee and graduate support for life!